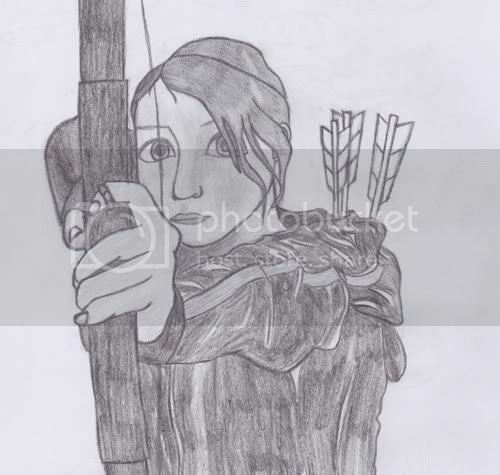 Just thought I'd show you guys my drawing of Katniss from The Hunger Games. Great picture! One question: Where is her arrow? Not bad, but I liked AE's fanart better. Thanks guys. As for the arrow, see the thing in front of her index finger? That's the arrow, or the tip of it anyway. You know what Amy? I think I do too. And if you think I'm being mean, go back and read AE's own post. Yeah, I agree that this is pretty good, but it's just not baaaad, you know? I could give you lessons, maybe. Yes, AE could help you curb your good artistic tendencies and hone your bad ones. I perfected my bad drawing skills a long time ago. I've just been trying to work on the good ones lately. That was an excellent comeback.